A WOUND IN TIME: WE ARE FISCALLY SPONSORED BY MEGA ARTS ORG FRACTURED ATLAS! WE ARE FISCALLY SPONSORED BY MEGA ARTS ORG FRACTURED ATLAS! 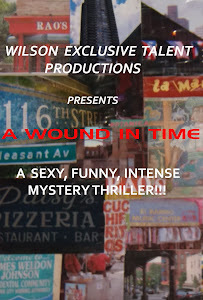 If you'd like to share in making a difference through the Arts please support the projects of Wilson Exclusive Talent Productions which is the production company of "A Wound In Time" and "Blood Makes The Red River Flow". Both these projects address social issues and provide little known facts and foster the appreciation of diversity with talented professionals. Thanking you in advance! THE CHARACTER "CHEE CHEE" IS QUITE A CHARACTER!